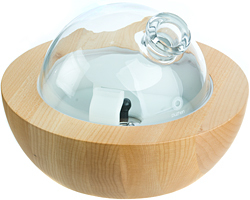 An Ultrasonic Diffuser Purifies Odors and Brings Relaxation! Purifies the Air and More! An ultrasonic diffuser is a type of essential oil diffuser that disperses essential oils into the air. There are several different types of diffusers but they are all fairly easy to use. And if you are an essential oil lover, then you definitely want to own one! Diffusers work by breaking down the essential oil into micro molecules then projecting them into the air to fill a room or work space. What are the different Types of Diffusers? There are several different types of diffusers and they are listed below with a simple description of each one. Cold Air Diffuser – A cold air diffuser uses room-temperature air to blow the oil into a nebulizer where it is vaporized. 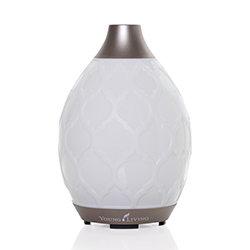 This diffuser can diffuse quickly and efficiently; however it is noisy and can be a little messy! It also can not effectively diffuse heavier, thicker oils and it is hard to clean. Evaporative Diffuser – This diffuser is very basic in operation compared with an ultrasonic diffuser. A fan blows air through a pad or filter where the oil sits and vaporizes the oil on the pad. The biggest problem is that the lighter oils diffuse off quicker than the heavier oils. So these are pretty ineffective compared to the other diffusers, but great for your vehicle or when traveling! Heat Diffuser – This method uses a heat source to disperse the essential oil. Any diffuser that operates in this manner will alter the chemistry of the essential oil so this is not recommended at all. Unless you want your room just to smell good! Why is the Ultrasonic the Best Aromatherapy Diffuser? Breaks down Any Essential Oil (no matter the viscosity or volatility). Why do I want to use an Ultrasonic? Diffuse at the barn or kennel to help purify the air and provide a relaxing environment! Want to Purchase a Diffuser? Than go to The Oil Shop or check out these great diffusers that come FREE with Young Living Membership! How Do I Use a Diffuser? Start by diffusing 15-30 minutes per day until you familiarize yourself with the effects. Then increase the frequency; generally diffusing oils for about 15 minutes out of every hour is very beneficial. But depending on what you are using it for, there are some recommendations that it be used 24 hours a day! Can I put Essential Oil in my Humidifier or Vaporizer? Yes, you definitely can but the cold air ones are the best. Heat alters the chemistry and thus the therapeutic effects of the oil. Are there any Oils that I can’t Diffuse in my Diffuser? Nope, diffuse away! And have fun! This is one of the best ways to enjoy and reap the benefits of essential oils! During the Christmas Holidays I like to diffuse oils such Balsam Fir and Spruce. Especially if you don’t have a Christmas tree or you have an artificial one! To purify up the air I like to use oils like Purification, Citrus Fresh and Grapefruit! Or experiment and make your own blend! You can’t go wrong! Happy Diffusing!